Tasikmalaya is located in the southern part of West Java, bordering on Garut City in the west and with City of Ciamis in the east. Tasikmalaya name originally was Tawang / Galunggung which in Sundanese means ‘wide rice field’. Tawang’s name was changed to Tasikmalaya after Galunggung volcano erupted because Tawang region is full of ‘sand ocean’ erupted Galunggung. In Sundanese, ‘tasik’ means lake, while ‘malaya’ means sand dunes. So, Tasikmalaya means a sea of sand dunes. Galunggung volcano into the type of young volcano that is still active today…. Eruption 1822; The early signs of eruption were known in July 1822, when Cikunir’s water became muddy and muddy. The results of the examination to the crater shows that the turbid water is hot and sometimes the smoke column appears from inside the crater. Eruption 1894; 7-9 October, an eruption that produces hot clouds. 27 and 30 October, lava flows in the same river channel with lava in 1822. Village destroyed as many as 50 pieces, some houses collapsed due to falling ash. Eruption 1918; July 6, eruption begins with an earthquake, causing a 2-5 mm ash of ash that is confined within the crater and the southern slope. July 19, a lava dome emerged in a crater lake as high as 85 m with size 560 x 440 m called So mountain. Eruption 1982-1983; The first eruption occurred on 5 April 1982, accompanied by the sound of booms, sparks, and flashes of lightning. The eruption took place for 9 months and ended on January 8, 1983. ‘Galunggung Tua’ Formation, which is the period of formation of the old Galunggung strato volcano. Tasikmalaya Formation, which is a period of horseshoe caldera formation as well as the sediment “Ten Thousand Hills” (Ten Thousand Hills). The Cibanjaran Formation, which is the “post caldera formation” period until the 1982-1983 eruption. Formation of ‘Galunggung Tua’; is the result of activities with the eruption center at Guntur Crater (‘Galunggung Tua’), which consists of lava flow, pyroclastic and lava flows, and dike that form the ‘Galunggung Tua’ crater. The age analysis by the 14C method in the strato layer resulted in the ages of 20,000-25,000 years, thus the age of all ‘Galunggung Tua’ activities was estimated between 50,000 and 10,000 years ago. The rock volume reached 56.5 km3, and the volcanic activity ended with a cryptodome intrusion under the Guntur crater. Tasikmalaya Formation; is a rock sediment “The Ten Hundred Hills” formed as a result of a massive eruption at 4200 +/- 150 years ago, which led to the formation of horseshoe caldera on the east-southeast of the Galuhung volcano crater. In addition to the sludge sediment “Ten Hundred Hills” other erupted rocks are hot clouds and lava. Cibanjaran Formation; is the result of eruption activities recorded in history, namely 1822, 1894, 1918 and 1982-1983. 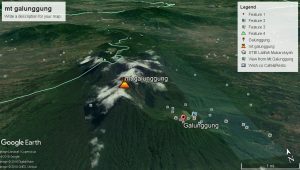 Mount Galunggung occupies an area of 275 km2 with a diameter of 27 km (northwest-southeast) and 13 km (northeast-southwest). In the west is bordered by Mount Karasak, on the north with Mount Talagabodas, in the east with Sawal Mountain and in the south bordering tertiary rocks of the Southern Mountains. In general, Mount Galunggung is divided into three units of morphology, namely: Cone of Fire Fire, Caldera, and Hill of Ten Thousand. The Volcano cones, occupying the western and southern parts, with a height of 2168 m above sea level, and have an inactive crater named Guntur Crater or crater at the top. This crater is a circle of 500 meters in diameter with a depth of 100-150 meters. This cone is an old Galunggung volcano cone before the formation of Caldera, has a slope of up to 30 ‘in the peak area and decreased to 5’ at the foot. Identification Mount Galunggung has the Montane Forest of 1,200 – 1,500 meters and the Ericaceous Forest> 1,500 meters.…?